As I've argued before, the bonds issued by the EFSF are already "eurozone bonds" if not "eurobonds" involving all the EU member states. And as I've also argued before, the EFSF and its bonds are illegal under the EU treaties. Firstly, there is no legal base in the EU treaties for the eurozone states to go off and set up anything like the EFSF, or for any use to be made of EU institutions in that connection, and therefore it has been established in defiance of the priniciple of conferral enshrined in the treaties, and in particular Article 13(2) TEU. "... it is far from clear that the article 136 TFEU amendment is really necessary in order to set up the ESM ... the ESM’s temporary predecessor, the EFSF, was successfully set up on the basis of another treaty article." that the EFSM was established through a Council Regulation based upon an abuse of Article 122(2) TFEU, but there was no identifiable legal basis at all for the EFSF. Secondly, the structure of over-guarantees for the EFSF bonds clearly breaches Article 125 TFEU. Of course provided investors trust that the eurozone national governments will keep their word and make sure that all payments on the EFSF bonds are made in full and on time then it doesn't really matter whether what the national governments are doing is legal or illegal under the EU treaties, and maybe Cameron and others are thinking along the same lines for other varieties of eurobonds. "Meanwhile, his predecessor at the ECB, Jürgen Stark, has said countries bailed out by the EU and International Monetary Fund should have been asked to leave the euro zone before being assisted. “If a country mismanaged itself and has to perform a correction . . then outside the euro area,” he said. “The currency union has already taken a hit. A severe cut at the start of the crisis would have been better.” Mr Stark said it was a “mistake” to allow the IMF help countries inside the EU. The EFSF bailout mechanism also sent a wrong signal, he said. “With that we buried the Maastricht Treaty, the legal basis for currency union,” he said." Well, what does he know, when Dr Gavin Barrett says that it's all hunky-dory and there isn't really any need to have the amendment to Article 136 TFEU? My primary reaction is that Monti and Rajoy know that this will most likely only waist time and if something comes out it most likely will take too long. It is simply counter productive to start the discussion again. And will anger Merkel (probably more than Cameron). Like a lot of economists' solutions. Solving a financial-economic problem by creating a political one is not really a good idea. And a full fiscal union or a political union is simply not acceptable in most countries. May be in the debtor states as long they profit from it, but also not longer term (as we see in Greece). But Merkel has made that very unattreactive anyway so also support South will not be massive. Solutions have to be found in the margins applicable and these proposals are clearly outside those margins. Fully agree that the legal foundation is dodgy at best, but the problem is these rules cannot be properly enforced (as the enforces are playing them) and not be properly tested in Court. And if tested likely deferred so long that all the harm has been done already and the measures de facto cannot be turned back. Which opens again the question of 'rule of law?'. 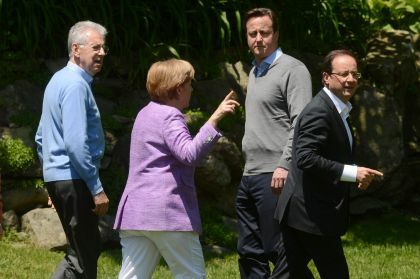 Cameron has roughly zero influence, however every time he gets himself caught up in the discussion. We also know that the closer you get to the problem the more money it will likely cost. - more important, he most likely increases the chance he will be asked to contribute. There must be a dearth of leadership material in the British conservative party , for them to have chosen David Cameron . Does he say anything right or do anything right , NO , a total yesman to the US , EU , you name it . To fathom his thinking is impossible , just to say the right thing to go along with the crowd. Are we to suppose that he has interests in the banking and financial world , or is that the only industry that Britain has . Does he know that banking and financial sevices in London are without regulation . American banks use London for fraudulent deals , Hypothecating is without limit , whereas in the US is limited to 140% . If you don't know what that is , look it up on the net . Cameron and his cabinet speak with forked tongues ; there only interest in saving the Eurozone is the impact its collapse would have on the UK . Cameron should know that taking Britain one step towards a political union , the people would slaughter him . If Cameron hasn't anything constructive to say , he should keep his mouth shut .